Just like the first mile of a 5K race you feel like you are running through velvet. Smooth, soft, comfortable…almost gliding. At mile two your thirst for the finish line increases, your eyes forward, targeting your next pass. At mile three your legs burn, just .1 miles to go…time to Hammer Down and finish strong…because when you cross the finish line of the Peticolas Brewing Company’s Velvet Hammer 5K; tasty brews await you and you get to tell your own race tale! Or heck, just walk it, we will have beer waiting for you. 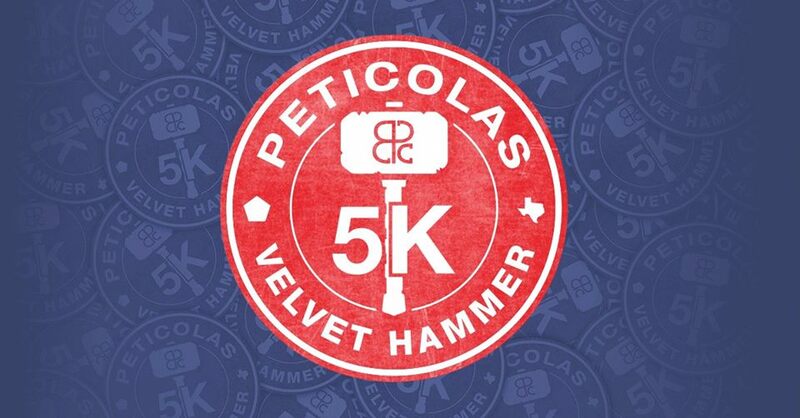 The festivities are set for Peticolas Brewing Company Velvet Hammer 5K! Join us on Saturday, April 21, 2018 at 8:30 AM at, of course, Peticolas Brewery, voted Dallas’ best brewery in 2017 by Big D Magazine, located at 1301 Pace Street (what is your pace? ), Dallas, TX 75201! Each registered participant will receive a gender specific, dry fit style shirt, custom finisher medal, a branded willi becher style finisher glass, three tasty Peticolas brews, refreshments from our sponsors and partners and chip timing. Do not miss the inaugural year of this epic event, heck yes, it is more than a race! Get registered today!